I have always considered Alan Turing to be my personal hero, the one historical figure whom I can look up to and acknowledge. Alan who? you say! His life story has been the subject of a recent movie, The Imitation Game, which made it to the final few movies for the Best Picture at the Oscars. It did not win, but just getting to this point is significant. Alan Turing was the inventor of the first stored-program computer, and in doing so is seen as the father of computing, the father of computer programming, and also the father of artificial intelligence, and yet he had to keep all of this secret during his life because of the official secrets requirements during WWII, and much of this was only opened to the public a relatively few years ago. Bletchley Park and its well-manicured gardens. I visited Bletchley Park in June 2014 as a prelude to my trip to the OpenCulture 2014 conference in London and I was more than surprised about how this has been converted into a modern user experience. 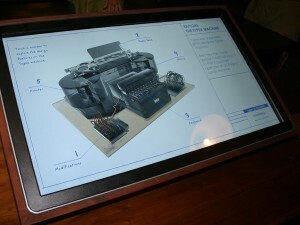 It was at Bletchley Park that Turing, and around 10,000 others at the peak, supported the war effort by decoding the German, Japanese and other country’s secret messages using an elaborate process in which different teams mostly did not know what the other teams were doing, and received inputs, processed them, and passed their output onto the next team. Turing’s team were the actual code-breakers who determined the nature of the message encodings for the day, and when their work was finished then thousands of messages for that day could be processed. The problem was that the mathematics of the decryption was so complex that it could not be done by hand fast enough so that the decrypted messages were then useful. Taking more than one day meant that the information in the messages were out of date and often useless. Turing’s approach, as exemplified in The Imitation Game movie, was to automate the process by trying out every possible combination of the Enigma machine settings, until it correctly encoded a message for which the result was already known. 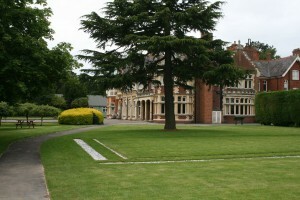 Bletchley Park was almost lost to us as a historical site, and with it many of the memories, since it was scheduled for demolition and conversion into low-cost housing, and it was only when the government discovered it did not own the land that this was halted and the conservation began. When I arrived and parked in the car park I walked to the little hut – a very unassuming entrance – and on entering I see a simple, effective, and appropriate reconstruction of the history of the park, with a minimal modern look and feel, and in the background, beyond the turnstile for the entrance, a video is showing historical images and movies. Everywhere there are helpers, all of whom are friendly, accommodating, and who want to help ensure that you have the best possible experience. We took the tour, which started in the chauffeur’s hut, and the tour guide introduces us to the environment and then we are off, walking around the ground, visiting the various places and huts. What surprised me was that he was a volunteer, and so was almost everyone else we met. People with such a passion that they give up their time to make sure that ours is well-spent. I contrasted this with the general lack of formal volunteer programs and activities at many South African museums and we can learn a lot from this experience. None of these volunteers would have had a direct experience with the activities at Bletchley Park, those who did would be in the late 80s or older, since this occurred too long ago, with the war finishing 60 years ago. After entering and moving into the initial area, I pick up my mobile unit, which is like a mobile phone with audio and video, and which is an exceptional help during the visit. There is so much content on this that I needed more than the three hours we had planned, and I need to get back to spend a full day there in the future. Anyone who knows me, and also know what we are doing in The ETHER Initiative, will know of my work in enhancing the user experience, and our own Virtual Tour Guide, which uses the visitors own mobile phones as an entry point. This is useful for museums who cannot afford these modern technologies and yet want to provide a part of the experience, and all the museum is required to provide is a free wifi limited to their own servers. However, this guide at Bletchley Park is a professional experience which cannot be achieved easily on a mobile phone or tablet, this is well designed both from the user interface and the structure and nature of the content, leaving you with a deep and lasting memory of what happened. Not too much and not too little – just enough content presented in a highly useable manner. The video panels embedded into desks. It is so tempting to introduce a range of technologies and to blast the users with the latest whizz-bang devices. But this was not done here. The technology is there, and is effective, but is almost hidden away, under the surface, with it being used to help explain things and not to impose itself onto the authentic experience of being there, back in the 1940s, when this was at the heart of the war effort. The individual rooms are immaculately reconstructed back to the expected condition they were in at time of their usage. This was an effort since much of the buildings were damaged and information about how they were used was lost. In particular, the visit to Turing’s office (nothing like the film, by the way) was an exceptional and emotional experience, given that the history of the entire world was dependent upon one man and his team, and things could have gone one way or the other. There is good signage everywhere, and information panels which explain things but without imposing themselves on you, and these are coupled by the mobile unit which provided the audio explanations and the videos. I would say that this is one of the top museum experiences in the world, and should be a must-see for every tourist to England, and especially those who are already visiting Oxford or Cambridge, since it is positioned roughly halfway between these university cities, which was not by accident, but by design – to facilitate access the top minds in the country. 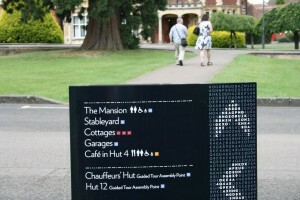 Frankly, Alan Turing would be proud of this new Bletchley Park, and perhaps more so than to know that his ideas are the basis for the entire computing revolution, and impact every single part of lives today in so many ways, and the larger impact of his work – the emergence of artificial intelligences, is a path which we are only just embarking on.